The best thing about storm chasing in Colorado is that it is usually free of the long lines of gawkers and chasers that you will typically encounter in Oklahoma or Kansas on a High Risk weekend. It’s storm chasing the Old Fashioned Way; where you don’t have to worry about being trapped on a crowded street as a rain-wrapped wedge tornado descends on you. It’s almost like the heyday of chasing when every person you met on the road was someone you knew from either a previous chase or from the community of storm chasers. So, not surprisingly, when I chased this past weekend I ran into several other storm chasers who I knew either personally or by reputation. The first chasers I ran into on Saturday were Justin Drake and Simon Brewer, the stars of The Weather Channel’s “Storm Riders”. 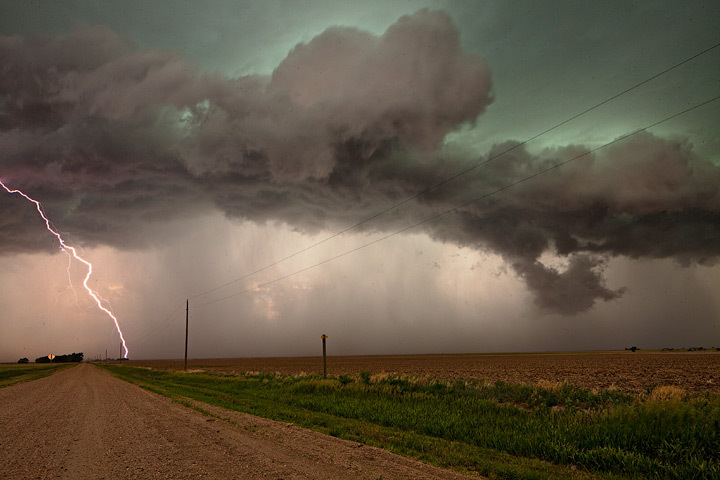 Since our chosen storm was not terribly exciting at the time, I had a nice conversation with them about chasing and photography, two subjects that we are all pretty passionate about. Shortly after, I stopped to say high to Roger Hill, one of the most acclaimed and respected pros, on a quiet road heading south with the storm. I’ve run into Roger at least a dozen times over the last 10 years, and he’s been a bit of a good luck charm for me, probably because he holds the Guinness record for most tornadoes seen. No terrific luck this time, though–just some real pretty storms and a nice sunset over the plains of Colorado. Wind Farm near the Nebraska border. 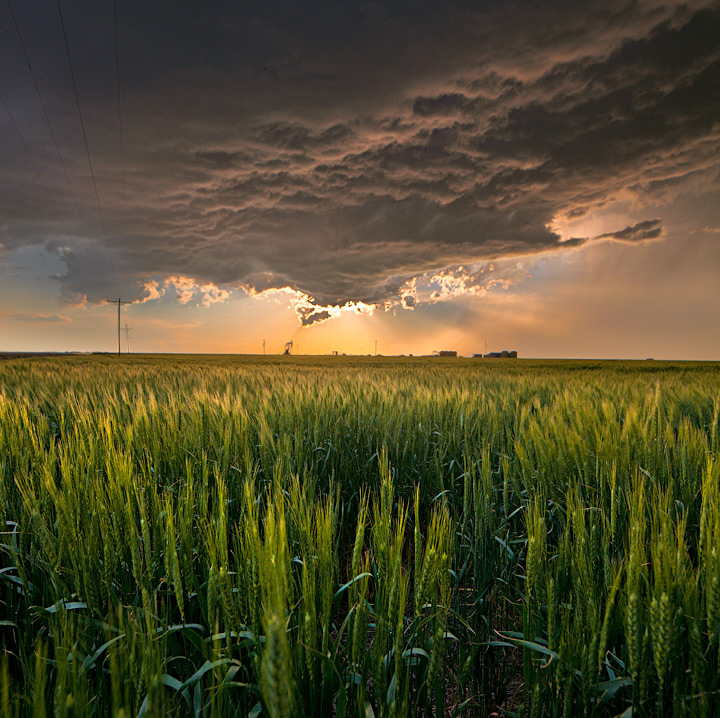 Wheat fields and storm as the sun sets. 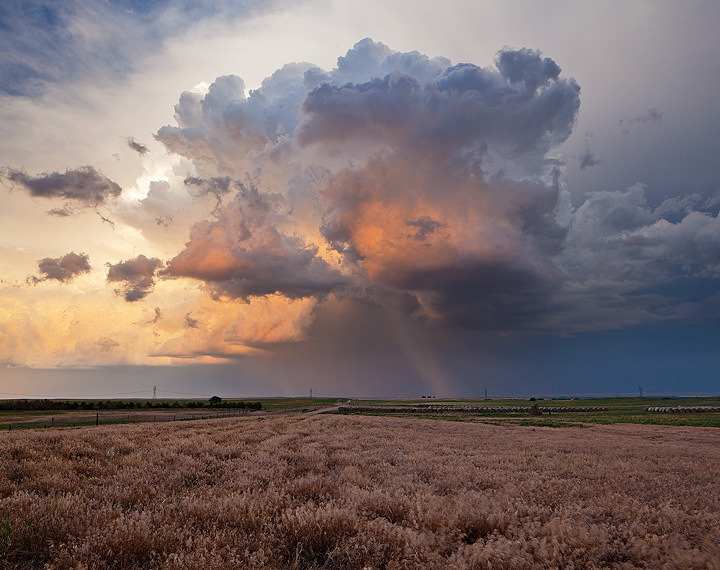 Thunderstorm and hail shaft at sunset, on the Colorado Plains. 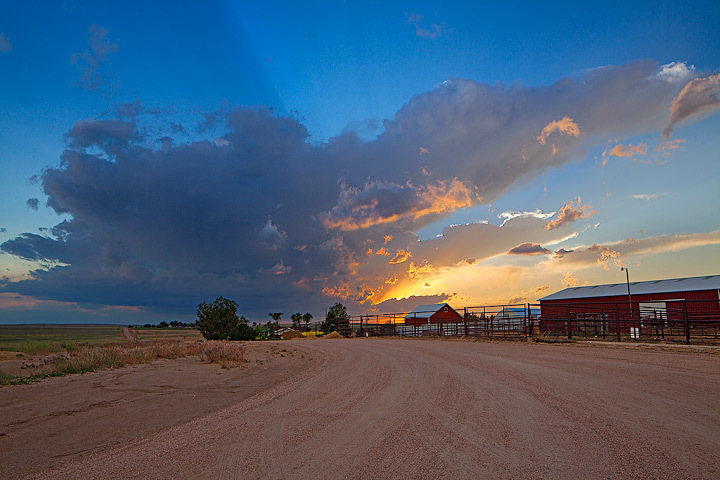 Sunset on the northeast plains of Colorado. 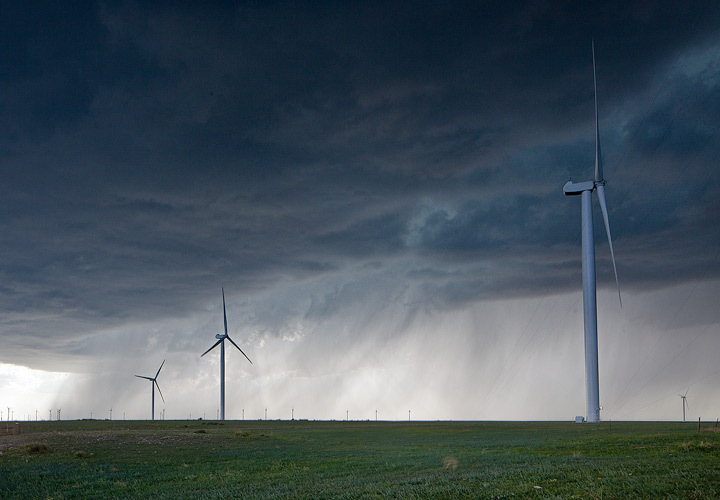 After a day’s break to let my tired car rest, I headed out again on Monday to chase some more Colorado storms. After making a traditional stop in Limon for some lunch at Oscar’s Bar & Grill, I caught a storm forming near the small town of Seibert, Colorado, in the midst of intersecting lines of cumulus clouds that I had picked out in a visible satellite image. I watched the clouds rapidly expand and eventually split into two separate storms, which is classic behavior for a fledgling supercell (rotating) thunderstorm. I ran into John Farley, who I knew from online forums but had never met in person, as he sat on the roadside waiting for the storm to strengthen. And Todd Thorn, another long-time chaser who runs a popular storm-chasing tour company. 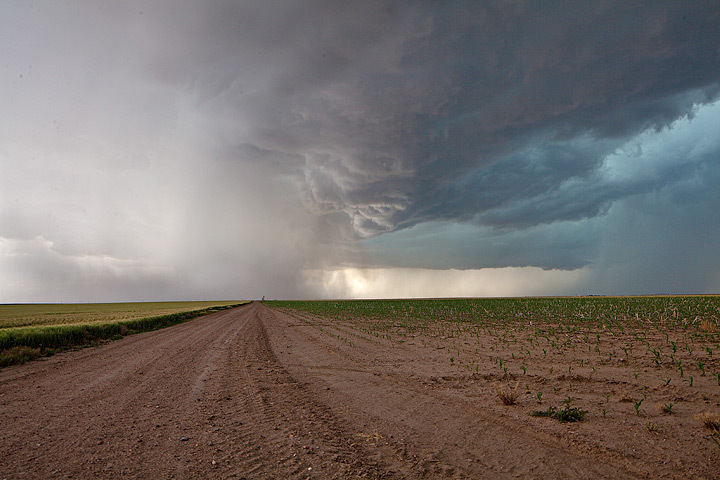 The storm eventually was tornado-warned after it dropped a small tornado near the town of Kit Carson. I must have been driving or simply not at the right location since I missed the landspout/tornado, but the storm had some impressive structure and I followed it all the way to the tiny town of Towner, Colorado, near the Kansas Border. I waited out a quick blast of quarter-sized hail driven by strong winds, then stopped for a bit at the town cemetery to take a few photos as the storm moved away and the sun set over the Colorado Plains. Not a bad way to spend a weekend–good Ol’ Fashioned Chasing! 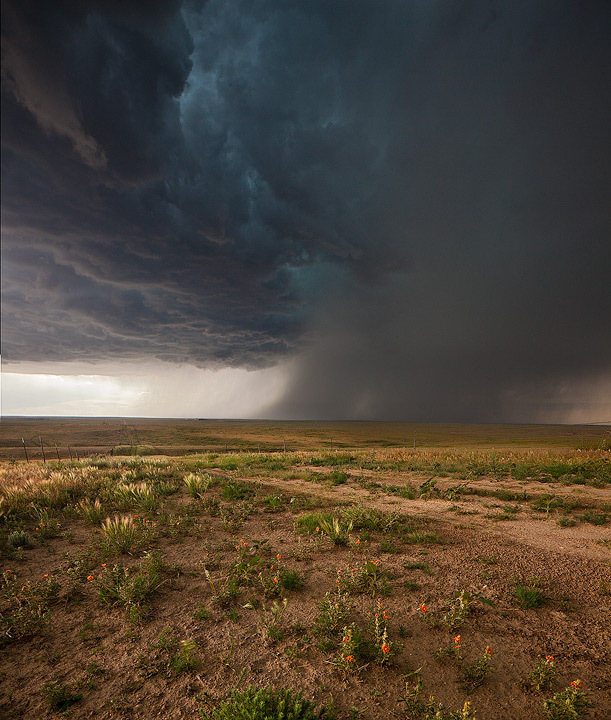 A thunderstorm moves away from the small town of Towner, Colorado. 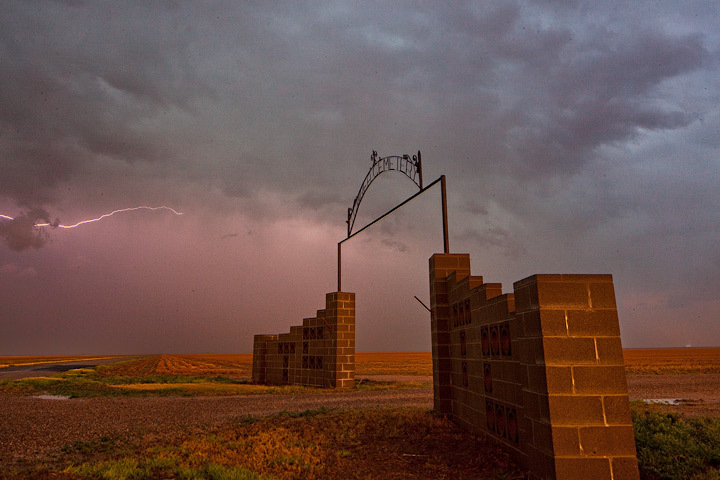 The Oklahoma tornado that tragically took the lives of Tim Samaras and several other storm chasers prompted much soul searching by that thrill-seeking community. Many chasers questioned their motivations for chasing, some even vowing to change the way they chase. I was not one of them. At the start of the season, I promised myself that I would chase every day off from work if there was at least a slight chance of severe weather within a 500 mile drive of home. Saturday, June 8 tested that resolve; it looked like the closest severe storms would be at least 400 miles away, and I figured my odds of seeing a tornado at less than 2 percent. 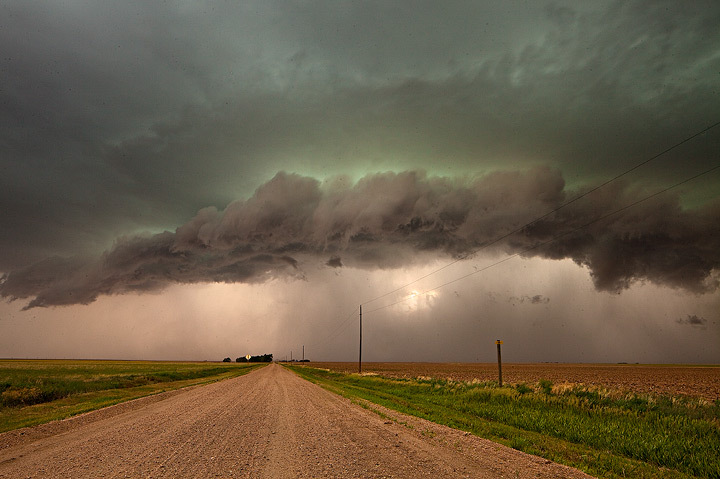 The experience of seeing a tornado is a great one, but it’s not why I chase. THIS is why I chase. 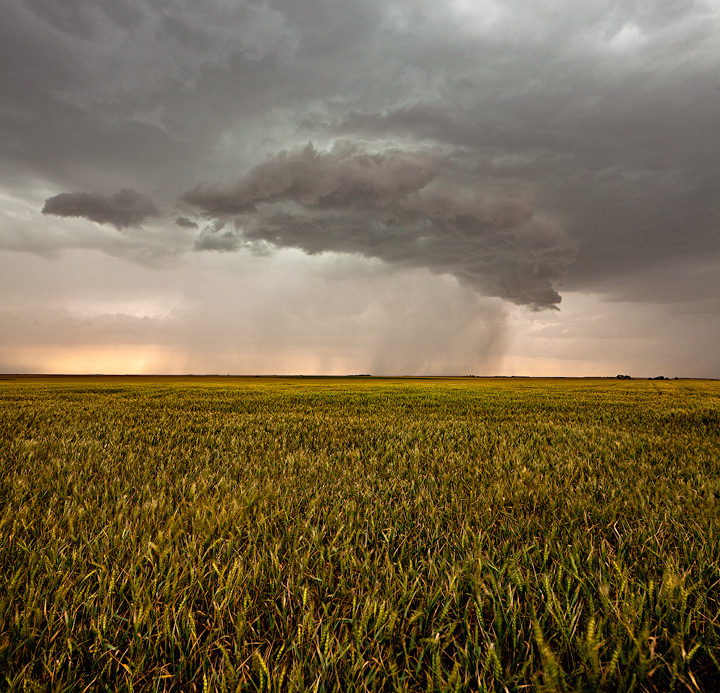 An angry storm brews over devastated fields. I left at 7 am, and made it from Pueblo to Hays Kansas by early afternoon, then stopped to reevaluate my strategy. My initial target had been extreme north central Kansas. The probability of severe weather looked best there, and the Storm Prediction Center had highlighted extreme southeastern Nebraska and Northeastern Kansas for a low threat of tornadoes. But the forecast was changing, and now it looked like the better storms might be to the south. All the storms were expected to form along a line, developing along a cold front that was advancing from the north and west. Cold fronts are not the favorite of chasers, because storms tend to form along a line, which makes it difficult to target any particular storm. Linear storm development also is not very kind to tornado development; it makes it difficult for a storm to organize in a fashion conducive for tornadoes. 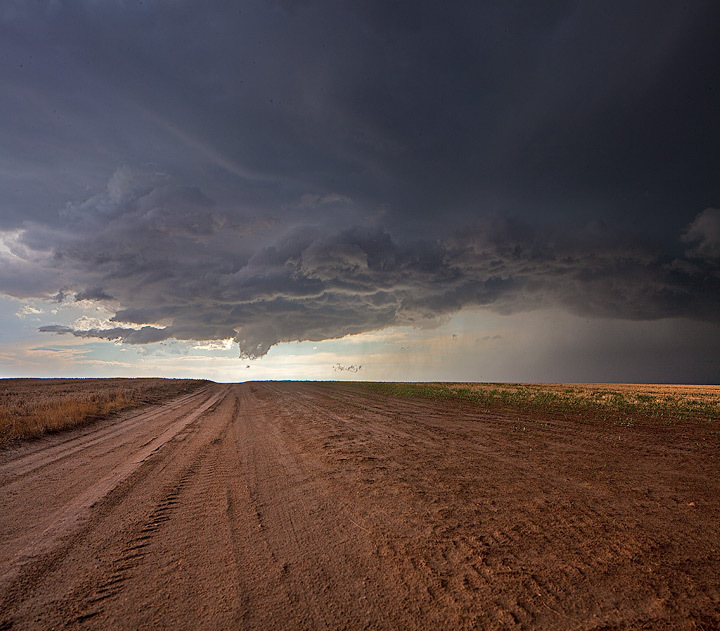 But I was not expecting tornadoes; I just wanted to see and photograph some pretty storms, and it now looked like my best bet was south, so I raced southward from Hays to catch the more isolated storms that were forming to the south and west. I got about 30 miles northeast of Dodge City when a tornado warning was issued for a storm nearing the city, the only tornado-warned storm of the entire line that now stretched from Oklahoma to Iowa. To get to that storm, I would have to blast through the northeast side into a wall of hail and heavy rain, something I was not anxious to do. I continued to move southwards along the advancing front, catching another severe storm that looked every bit as dangerous as the storm that was tornado-warned. I pulled over onto a dirt road and set up my camera, as the beast edged closer to me. I looked up and saw rapid rotation in the cloud above, and I half-expected a tornado to drop right then and there. But that is not why I chase. The lighting surrounded my car like a cage, and a shiver went up my spine as the adrenaline kicked in; THIS is why I chase. Severe thunderstorm explodes along a cold front. 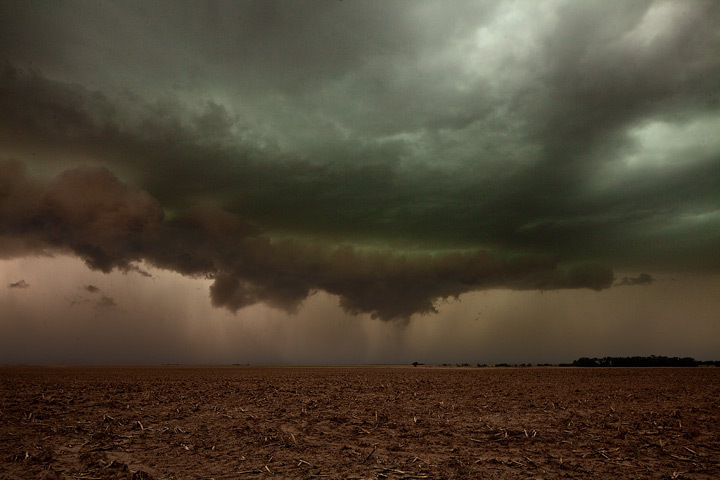 A rotating storm rapidly gains on me as I photograph its violence. The storms were advancing quickly to the south, into Oklahoma, and I knew that if I kept chasing them I would have a very long drive home. So, I decided to change strategies and head northeast, to get to the backside of the line of storms for sunset. Post-frontal light is some of the best light you can hope for; there is nothing quite like the light and air that follows a severe storm as the sun prepares to set. THIS is why I chase. Nothing beats a sunset after a line of severe storms have passed. I spent nearly 30 minutes photographing and taking in the sunset in a part of southwest Kansas I had rarely visited. It was more like New Mexico or the other states to the west, with rolling hills, arroyos, and short buttes. The air was clean and the light was spectacular. THIS is why I chase. 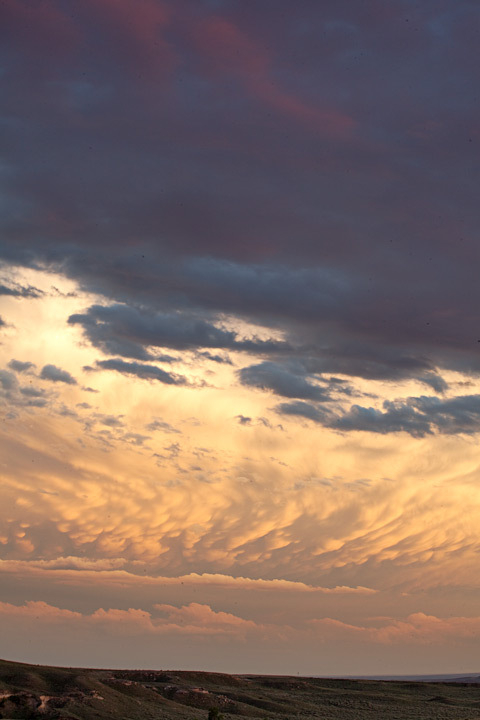 Mammatus covers the sky at sunset over a remote part of southwest Kansas. 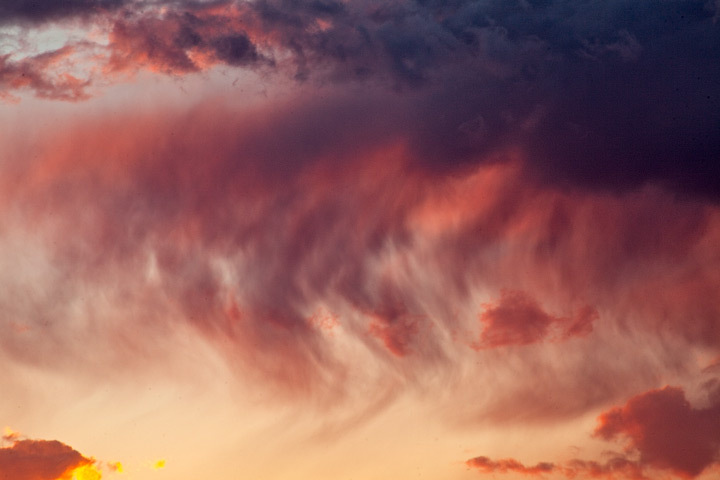 Virga and the setting sun combine to make an abstract painting in the sky. After sunset, I continued north towards Dodge City. 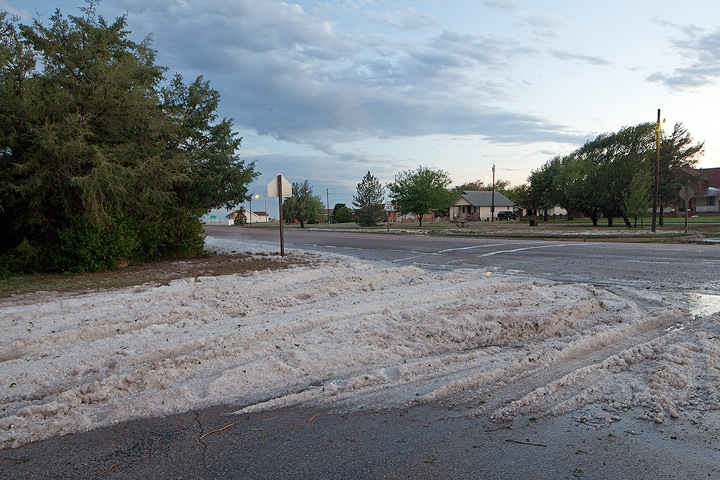 As I passed through the small town of Mineola, I stopped to check out the mounds of hail that covered the streets and lawns. It was over a foot deep in spots—this was not snow but millions of penny to quarter-size hailstones! I was glad that I made the earlier decision not to drive through this hailstorm. Amazing… THIS is why I chase. Penny to quarter sized hail in piles up to a foot deep cover the town of Minneola, Kansas. Hail fog is caused when hail on the ground cools the warmer, moister air just above the ground. I’ve witnessed it several times before, but the hail fog in Mineola Saturday night was especially intense and eerie; I’ve never experienced anything quite like it, and it gave me goose bumps. When you storm chase, If your expectations are not to see a tornado, but to see something you’ve never seen before, something that will open your eyes to the incredible beauty that nature provides—you WILL be rewarded. I was rewarded, and the 900 miles or so I drove felt like nothing. THIS is why I chase. 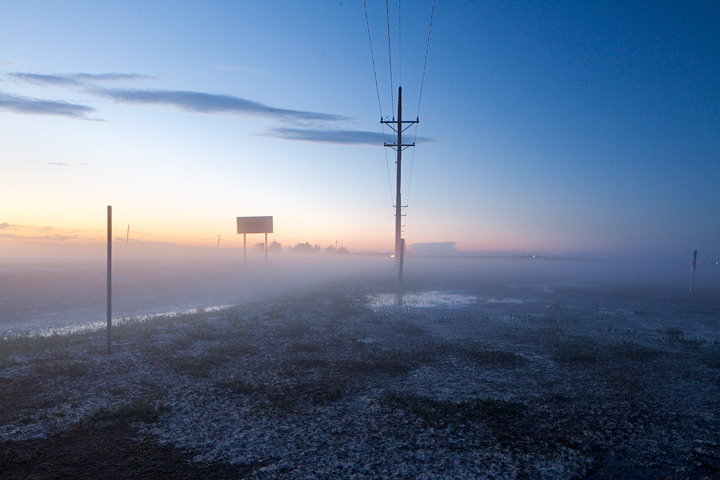 Hail fog spreads over Minneola, Kansas, following a huge hailstorm.